i know, i know, i’ve written about this place before, but i just can’t get enough of the hy-mart deli! the modest little sandwich shop in the valley continues to make most scrumptious wraps i’ve ever eaten. plus, the family who owns it and works the counter are sweet, friendly, and most importantly knowledgeable about veganism. if i lived in the north hollywood, i’d be grabbing food from hy-mart everyday. my latest feast from hy-mart was bennito’s burrito. the wrap in its original form is vegetarian, but the cool dude making it was more than happy to veganize it, giving me hummus instead of yogurt. it was filled right up with soft and spongey falafel, loads of avocado, and fresh chopped vegetables. i can’t even tell ya how tasty it was. i think i am gonna make it a mission to try every vegetarian wrap on hy-mart’s menu (veganized, of course). looks like i have my work cut out for me! yum yum yum. 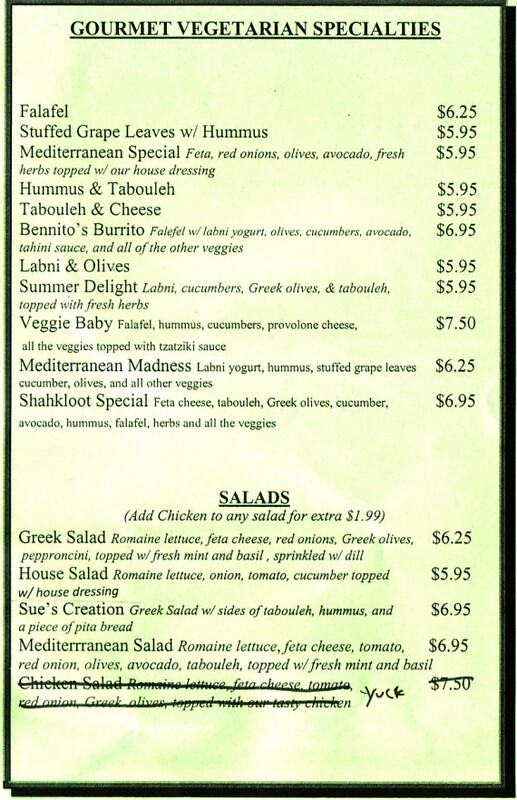 vegetarian menu, all can be made vegan. It’s true, I live in NoHo and eat there way too often… not everyday, but close! I always order the same thing though because it’s so good: the Shakloot with no feta and no onions, and they make it nice and spicy for me with hot peppers, cayenne (I think?) and extra sumac. On a good day the dad will often replace the feta by putting in extra falafels for me instead. Yum… I think I know what I’m having for lunch today, thanks! I went there for lunch after reading this. Ordered exactly what you did. Excellent call. 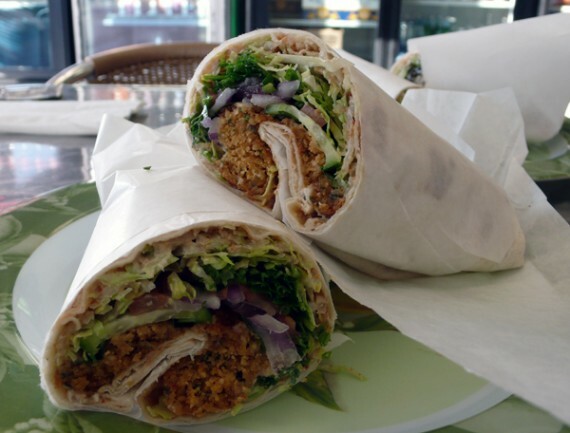 A big, fresh, delicious wrap. Bennito even gave me an oral history on the creation of the sandwich. He and his parents are super friendly- a total neighboorhood feel. I don’t know what else one could ask for in a deli. Oh falafel, dear falafel! This looks sooo good! I had a major falafel craving at lunchtime today and had to give in, also. This is just another post that makes me wish I could sprout little wings on my back and fly over to Cali for a meal every once in a while! I used to live within walking distance of Hy-Mart and would eat there at least once a week. They’ll make anything to your order, even if it’s not on the menu. Once the papa made me the best sandwich ever. Unfortunately I can’t remember what was in it, but I know there was basil. After I moved away three years ago (to far-off Burbank) I rarely went, but I recently took my boyfriend there for a weekend lunch and they totally remembered me! And remembered that I was vegetarian. Sweet, sweet people with fresh yummy food. I picked up a vegan sandwich from here today and it was quite good. I’ll be going back to try more veganized items from their menu.